The line was just short of 20 miles long. Trains leaving Malton station headed on the Scarborough line for about 1/4 mile to Malton East where double tracks branched off and ran parallel with the Scarborough line for another 1/4 mile thence curving and rising to Scarborough Road Junction, where the T&MR joined the M&DR. From this point the line became single track. At Driffield, the line joined the Hull Bridlington branch of the YNMR about a 1/4 mile south of Driffield station. In 1890, the line from Selby and Market Weighton was built and joined the M&DR at Driffield West Junction. At this time, the line was doubled from Driffield West to the junction with the Bridlington line. The steepest gradient was 1 in 64 on the Down (southbound) direction between North Grimston and Wharram. Up trains encountered a maximum of 1 in 67 approaching Burdale but overall, the Up trains did not have such a long, steep climb as the Down trains. The summit of the line was 410 feet above sea level and this point was in the tunnel near the north end. Burdale tunnel was just a few yards short of being a mile long. Station buildings were contracted out to local builders and were of little architectural significance. They had the appearance of farm buildings. Low platforms on just one side of the track were provided. Over the years, the buildings were much modified and platforms raised. 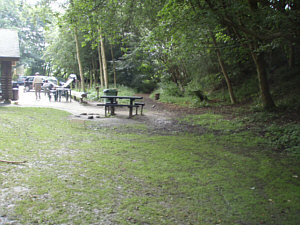 Thank you to John Broadwell for the photograph of Fimber picnic site - at the location of Sledmere & Fimber station.